Preserved in the archives of the former Royal Greenwich Observatory is the very notebook in which Halley wrote the sightings of ‘his’ comet. It consists of 180 pages, seven and a quarter inches high by five and three-quarter inches wide, now brown and stained by age, containing a jumble of calculations, geometrical figures, and observations in Halley’s often untidy handwriting. Originally it was a college exercise book which Halley continued to use for many years after he left University, gradually filling in all the blank spaces with notes in English and Latin (the scientific language of the day), sometimes upside down or even superimposed on previous entries. Evidently Halley did not yet have his sextant with telescopic sights set up at Islington, for he made only rough naked-eye estimates of the comet’s position, witness this entry for August 31: ‘The comet was on the straight line which passed through the leading shin of Boötes and the elbow of his left arm. Then clouds near the horizon obscured the comet’. When Halley came to calculate the orbit of the comet thirteen years later he never used his own observations but relied instead on the precise positions obtained by Flamsteed at Greenwich. Still puzzled by the seemingly wayward motions of comets, Halley in 1684 travelled to Cambridge to consult the greatest mathematician of the age, Isaac Newton. There Halley found to his amazement that Newton, in scholarly isolation, had been at work for nearly 20 years on a theory of gravity that would explain the orbits of planets and comets. Halley urged that Newton should write it up for publication and he undertook that the Royal Society, of which he was now Clerk, would publish it. Thus began the story of the Principia, one of the greatest scientific books ever written, which presented to the world Newton’s theory of gravity and his laws of motion. As events turned out, the Royal Society pleaded penury and Halley, the only person who understood the full significance of the book, ended up paying for its publication himself. Its first edition came out in 1687. If Newton ever offered to help with the expenses, that fact is not recorded. Comets feature prominently in the Principia as proof that the Sun’s gravity controls the paths of everything within its ambit, not just the planets. Straight lines like those of Kepler were no longer conceivable: curved paths were required. Newton concluded that the right shape to explain the motion of the comet of 1680 was a parabola, which is a curve like a long, thin ellipse but which never closes in on itself. 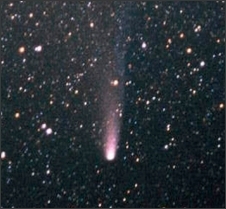 Gladly seizing the hint, Halley embarked on a long-term study of comets and their orbits. He came to realize that the orbits of most comets, perhaps of all, were not parabolic but were elliptical in shape, like exaggerated versions of the planets’ orbits. Some years later, while checking some figures, he found that one of the positions Newton had used for the comet of 1680 was incorrect. Substituting the correct figure, Halley was able to calculate a better orbit. It was an ellipse after all. Halley was laboriously building up a table of orbital statistics against which any ‘new’ comets could be compared to see if they had appeared before. Consequently he was particularly excited by the comet of 1682, the one he had witnessed from Islington. If his calculations were correct – and since he was using the excellent measurements made by Flamsteed at Greenwich there was no reason to doubt it – this comet was the same one that had been seen by Kepler in 1607 and by Apian in 1531, orbiting the Sun every 75 years or so. Slight differences in the interval between one appearance and the next could be accounted for by the gravitational nudges of the planets. The fruits of his labours were published in 1705 in a paper entitled Synopsis of Cometary Astronomy. More than 10 years of wearying research and computation were distilled into a table listing 24 comets and the vital statistics of their orbits. Halley declared his suspicion that the comets of 1531, 1607, and 1682 were the same, and ventured ‘to advise posterity carefully to watch for its return about the expected year 1758’. As time went by, his confidence in his prediction grew. In a revised version of his paper, published posthumously, he went so far as to make a request of history: ‘If according to what we have already said it should return again about the year 1758, candid posterity will not refuse to acknowledge that this was first discovered by an Englishman’. 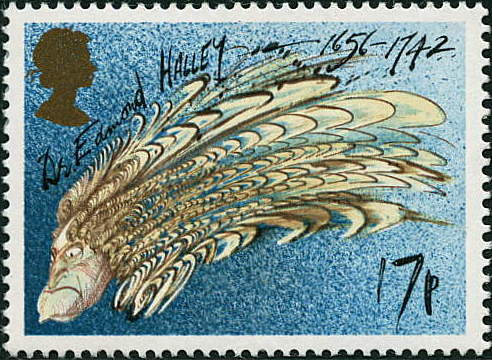 This British postage stamp depicts a bewigged Edmond Halley looking much like his comet. It was released in 1986 at the last return of the comet. Click on the picture for more information.